SYDNEY HARBOUR OVERVIEW. This photo taken from North Head. 151 degrees east, 34 degrees south (approx). Looking to west. Left : Hyundai 202 dropping pilot - South Head - shipping channels - Eastern Suburbs. Right : Middle Head bushland - Bradleys Head - city, Centrepoint Tower tallest structure. Top of Sydney Harbour Bridge visible to right. 8K in direct line to bridge, 10k via shipping channels. Note need for two sharp turns by shipping entering and leaving. Prevailing swell from left (south east). Sydney ports are not busy by European standards. Check the Ship Schedule below. But the locations shown are all good tourist visits. Most of them face south with the sun thus behind the camera. Many are on high ground looking down on ships’ decks. - 45 minutes to Prince of Wales Drive, Botany Bay. 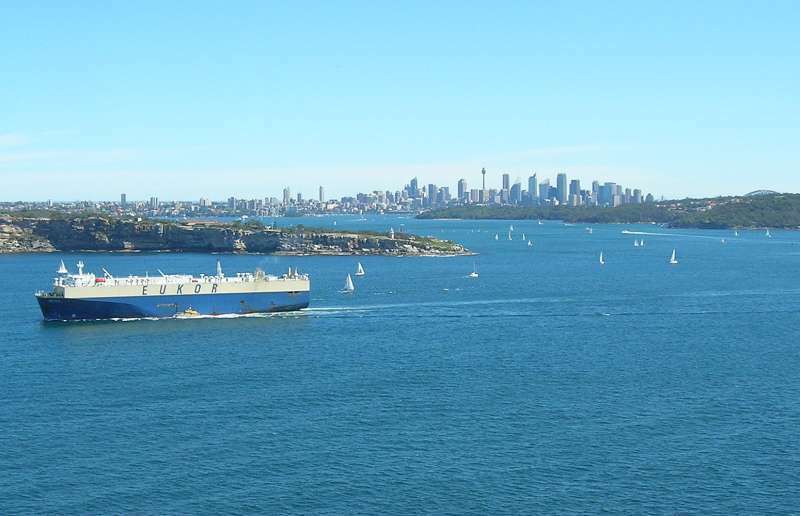 - 30 minutes from Sydney Heads to Brahttps://www.portauthoritynsw.com.au/sydney-harbour/daily-vessel-movements/dleys Head, (south tip of Ashton Park)..
- Departures time is for commencing dropping mooring lines. - In Sydney Harbour, half hour + from then to Bradleys Head (south tip of Ashton Park). Search Google Maps or Google Earth with the co-ordinates given. Go to Port = Sydney, or Go to Port = Botany. Then Use street maps for land navigation. SHIPSPOTTING LOCATIONS THAT CAN BE REACHED BY PUBLIC TRANSPORT. Part of bus, train and ferry interchange. Take pics from ferry, or wharf, or Circular Quay East. Walk around Farm Cove from Opera House, or across Domain from CBD. Check with driver of hop on hop off Sydney Explorer bus. Ferry from Circular Quay to Balmain East/Darling Harbour. First stop. By car. Towards Harbour from Kirribilli. Picnic areas, parking metres. Cafes. Ferry from Circular Quay to Balmain East/Darling Harbour .Second stop. Walk 400 metres west to Blues Pt. From Waverton railway station walk 500m (50m past SES turn off), veer right then follow one way road. By Car. In North Sydney, off Pacific Highway turn at Bay Street to drive to Balls Head Reserve. After Gore Cove to right oversight, continue 1km on loop road to view Walsh Bay, Darling Harbour and Mort Bay. Picnic areas, toilets, parking spaces. Taronga Zoo ferry from Circular Quay. Then 20 minute bush track walk from wharf, keeping water on right. By car. Military Road to Bradleys Head Road, after zoo take left turn off to Bradleys Head (in Ashton Park). Parking metres. Picnic areas, toilets. Steps down to Taylors Bay 200m east. Bus Route 244 City to Chowder Bay. After passing Mosman, 15 minute walk from Suakin Road bus stop,. Location for shots of vessels in shipping channels, and at Chowder Bay Naval Wharf, and Bank Anchorage. Bus Route 244 City to Chowder Bay. After passing Mosman, exit bus at HMAS Penguin then 15 minute walk east. Bus Route 244 City to Chowder Bay (bus terminus). Café, toilets. About 1 hour bush walk west to Bradleys Head and Taronga Zoo ferry wharf, keeping water on the left. Then bus route 135 outside wharf and 1 km walk from North Fort Museum terminus. Bus route 443 from Queen Victoria Building York Street city to National Maritime Museum. By Light Rail. From Central Station to John Street Square station. Picnic areas. Toilets. Parking metres. Cafes. Balmain for Svitzer tugs and Sydney Ferries bases. Botany Bay, La Perouse above Bare Island. By car. At end of Bunnerong Road Parking spaces with views. Picnic areas and toilets. Cafes. Botany Bay. South end of Prince of Wales Drive. Greenwich Road off River Road North Sydney, left Manns, left George, right Victoria, left Prospect. Left off Darling Street Balmain at Rowntree Street or Short Street. Right at Ballast Point Road to Ronald Street. Navigate one way areas. One block up Phillip Street hill from Circular Quay. Corner of Bridge Street. Excellent set of scale models of the First Fleet which brought original English settlers in 1788. Concise overview of Sydney history. Australian National Maritime Museum. Includes on water exhibits. Ferry from Circular Quay to Balmain East/Darling Harbour. First stop at Darling Harbour is King Street for Aquarium. Stay on board to cross water to ANMM. Part of the Sydney Harbour Heritage Trust. The first of its two dry docks was built by convicts and was completed in 1857. Maritime industrial activity ceased in 1992. There is now a separate category for Shipspotting Locations, found at the end of the Category listing. Thanks Nev. As I said 11 months ago, Perhaps other members could do something similar for pics of their locations with a title commencing with ... Shipspotting locations ... so that they could be found by searching those words. There are frequent requests for guidance in the Forum. And what about you uploading some of the shots you take? It is not a busy port but there are many opportunities to turn what some would call background clutter into location identification enhancement. Great treasure trove of information Clyde. I mostly take photos from around Circular Quay. Fabulous photos !! Thank you very much, Clyde! I plan to visit Sydney next week, so I'll be sure to take good advantage of this extremely useful information! darn you were busy back then CLYDE !!!! Shipspotting requirements have given me a good new sense of discipline and technique about taking and enhancing photos. And I certainly enjoy the subject I work with. This photo has been shown 10,034 times since it was added to the site.